Hello! And thanks for stopping by 20/20 Eye Care’s blog! My name is Abigail Smith – one of the contributors – and I wanted to start off by introducing myself. I am currently a third year optometry student at the University of Missouri – St. Louis College of Optometry. I am a proud Alabama native – I grew up in Decatur, moved to rural Somerville in middle school, and graduated from Auburn University in 2016 (War Eagle!). 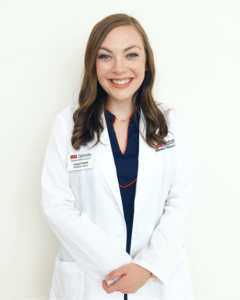 My journey into the field of optometry didn’t begin until my sophomore year of college – I wasn’t sure what kind of career path I was going to pursue, although I knew it would be in the medical field. I was lucky enough to shadow an amazing optometrist here in Huntsville, and I fell in love with the profession immediately. I continued shadowing and learning more about eye care throughout undergrad, leading me to shadow here at 20/20 Eye Care with Dr. Pittenger the summer before my senior year. I have continued shadowing with Dr. Pittenger and Dr. James whenever I’m visiting Huntsville, so you may see me at your next appointment! As a third year optometry student, I am currently splitting my time between taking classes and seeing patients in clinic! It has been so exciting to begin my clinical experience. Caring for patients – whether it be by providing better vision through a new prescription or by managing eye disease – is challenging but most of all REWARDING. I love what I do, and every day I get to see patients makes me even more excited for my future as an optometrist. In my free time, you can usually find me running through my favorite park in St. Louis, eating ice cream, or spending time with my friends. I love music, photography, learning, and laughing. Again, thanks for stopping by! I’m excited to share with y’all some awesome optometry news and other lifestyle info.